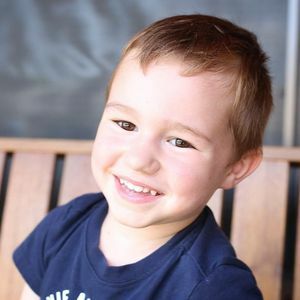 Leon Robert Sidari, age 4, died early Christmas day morning in San Antonio, Texas from an aggressive influenza. Leon was a gentle, loving boy who always looked out for his younger brothers, Tristan and Cameron. He loved building a snowman with his father, Tony, in the recent and rare Texas snowfall, and being the little man for his mother, helping out each day with his best friend and dog, Sawyer. Leon loved giving rather than receiving, collecting countless stuffed cats, knocking down sandcastles at the beach, skipping stones into the lake, cooking imaginary meals, and feeding the birds. Leon is survived by his parents, Tony and Laura (Lyman) Sidari, two brothers, Tristan and Cameron, grandparents Gail/Nathan Lyman, Lori/Mitch Murek, Paul/Margie Sidari, and innumerable extended family members and friends. Add your thoughts, prayers or a condolence to Leon's guestbook.